Hey, did you know I’m going to Gen Con? If you didn’t you clearly haven’t been paying attention anything I’ve been saying for the past few week. I am deep into my preparations for the convention and hopefully will get everything put together in time, but I did want to take a moment to make an announcement and show off a few things I’ve been working on. On the first count, I wanted to announce that I will be doing a post here each day of Gen Con to chronicle my experience at this great convention; depending on how busy my evenings are these posts my end up being a simple gallery of photos with a short blurb about the day, but I will make sure I do a full run down of things once I get home from the convention. 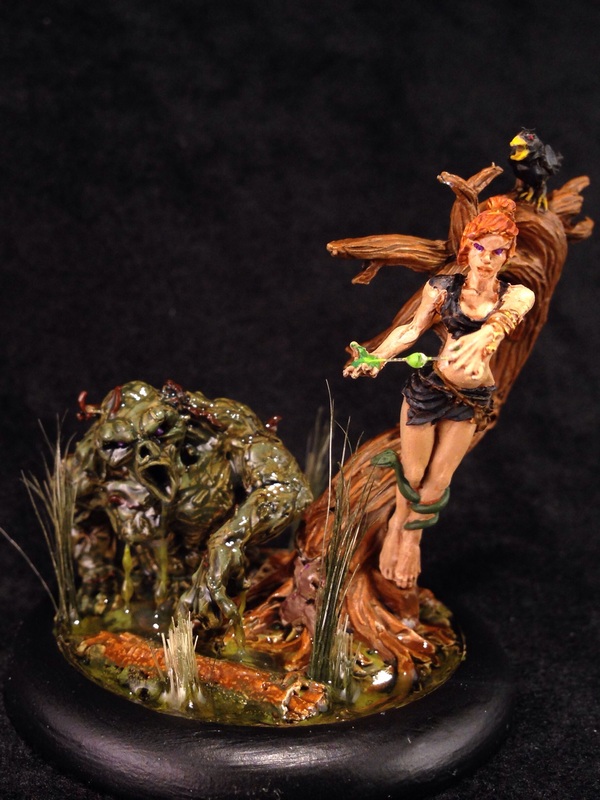 If you’ve been following this blog, over the past few weeks you have seen many of the miniatures I’ve been working on to take with me to Gen Con. The photo above is a look at the tray I quickly put together last night so I would have something to move my models from table to table with when I’m at tournaments so I’m not constantly going back to my carrying case(WiP Bad Juju included for scale). 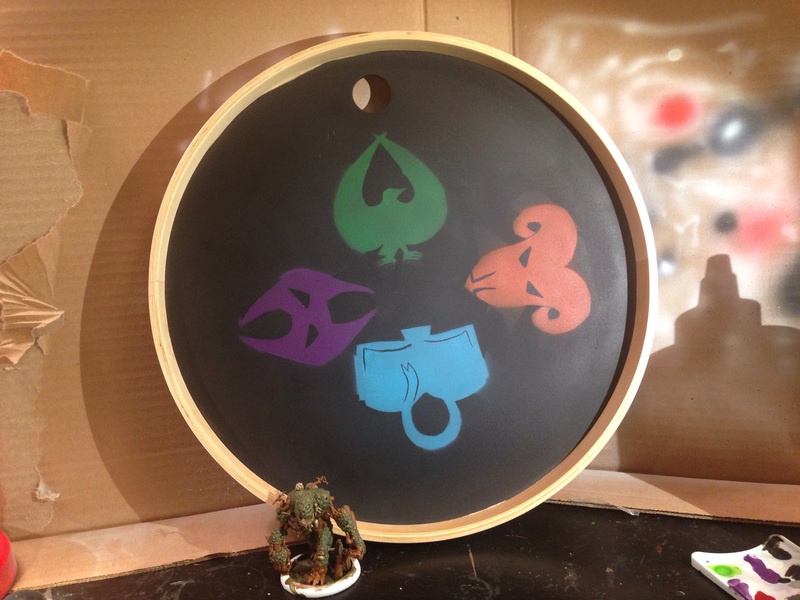 It’s an Ikea tray I picked up for about $10, masked off the side walls, sprayed black, and then stenciled in the suits of a Malifaux deck using some images I found online. I went back and did a little freehand to get the tiny black line details that were too small to stencil and then sealed the whole thing with a heavy coat of matte varnish. I’m happy with how it turned out and an added bonus of the varnish I put on it is that models don’t slide around on it as much now; I actually placed a Canine Remains model it on this and as a test was able to tilt the tray well beyond 45 degrees without it sliding at all! As to other things I have been working on, I only have three more models left that I need to finish up before I head to Gen Con. Considering that their crew box only came in last week, I would say that these Oxfordian Mages are coming along nicely. Hopefully I’ll have enough time before I leave to add in some lighting effect coming from their spells. 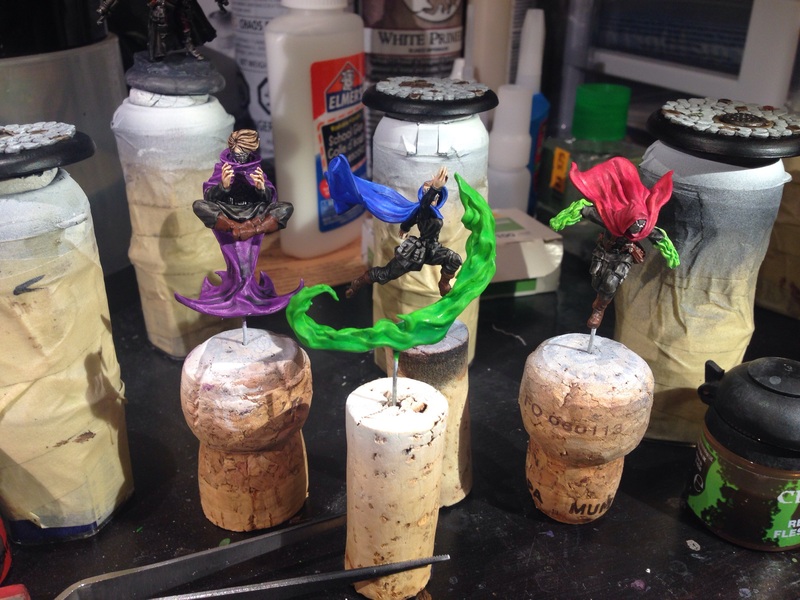 As each of the Oxfordian Mages can take a different free upgrade that affects what they do and how they buff any friendly model with the Warding Runes upgrade, I decided to paint their capes colors to match the upgrades I will usually give each. The red-caped mage is the Blood Ward mage; this is the upgrade that lets him use his spells as close combat attacks, so it made sense to give it to the mage with spell effects on his fists. The blue-caped mage is the Nemesis Ward mage; the color choice for this mage wasn’t as obvious (Blood Ward getting a red cape isn’t much of a stretch), but she gets bonus Tomes to her casts and Tomes are blue. As the blue-caped mage will automatically get her fun triggers without any friends around, it made sense to me to have this upgrade go on the mage with the huge spell effect. The last mage is the Doom Ward mage, who I gave a purple cape. The only reason I gave him a purple cape is because I have really been enjoying painting purple lately; seriously, that is the only reason I chose that color. 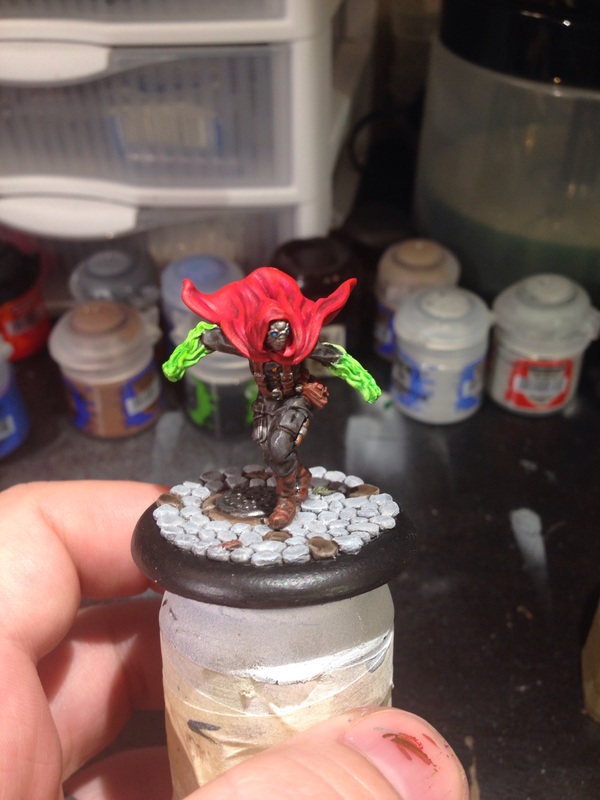 At this point I have the Doom and Blood mages mounted on their respective bases, the Nemesis mage still needs some detail work and is shown temporarily attached to the base it will eventually live on. The Doom and Blood mages are effectively finished, but if I have time I will be adding in some lighting effects coming from their spell effects. But the Doom ward has no spell effect you say! 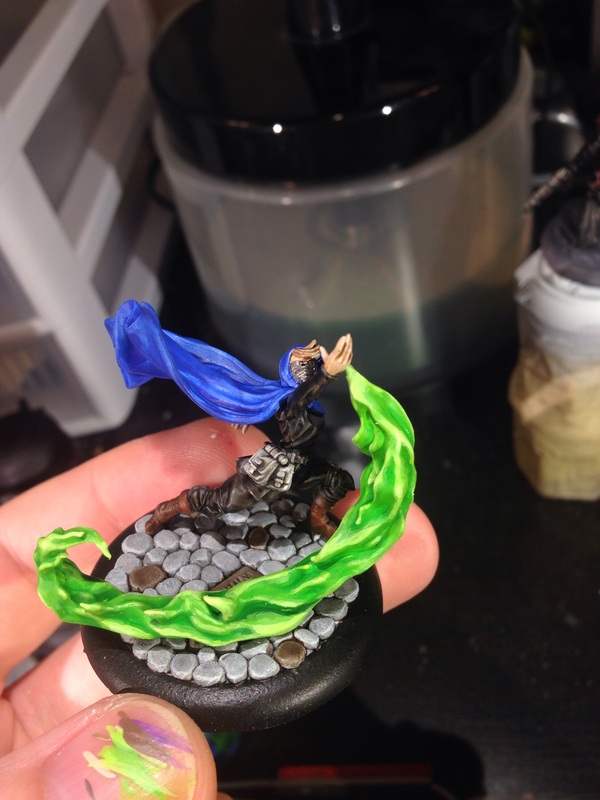 Well, I plan on adding in a glowing ball floating between his hands like I did for Zoraida’s avatar in my Iron Painter Round 3 piece. 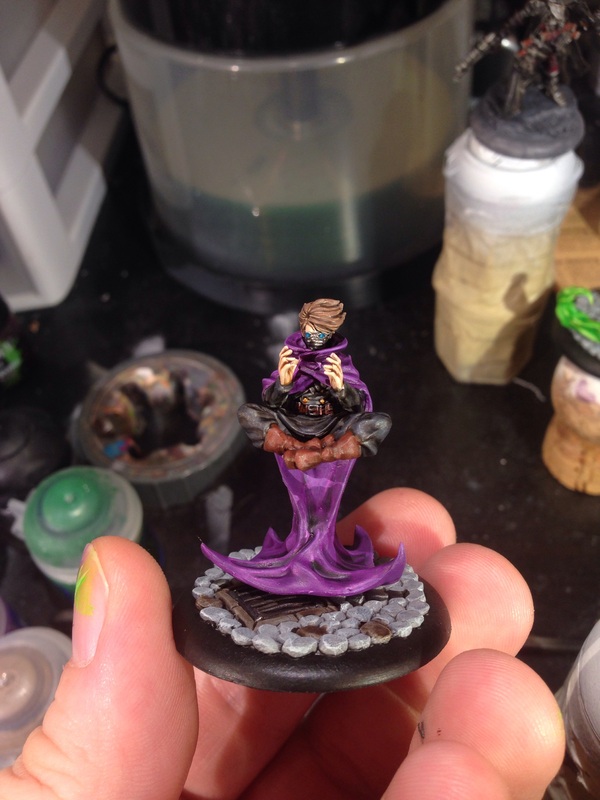 Once the Nemesis mage is finished and mounted on the base I will be going back and adding in the lighting to all of the mages, that way they are all at least painted to a quality acceptable to take to the tourney I need them for even if I don’t have enough time to add lighting effect to all of them. Check back soon to see how everything turns out! And don’t forget to check in during Gen Con to see how awesome everything is!